I amnot well versed in horror. Nor am I well versed with Dan Simmons. Case andpoint, I’ve only read one Dan Simmons book all the way through and while I enjoyedit, many reviewers hated it (Ilium).Then I tried to read Olympos, andbarely made it 100 pages before I had to put it down. Carrion Comfort may be, unless my pregnancy brain is strikingagain, the first true-blue-through-and-through horror book I’ve ever read. No,let me take that back. It is, however, the first one I’ve read with a blurbfrom Stephen King on the front cover. Carrion Comfort is one of Simmonsearlier works. It was first published in 1989 and again in 1990. The bookitself takes place in 1980. Unless you specifically note the lack of computersand cell phones and some mentions of West Germany, you really wouldn’t noticethe time period. Carrion Comfort isbased on the concept of psychic vampires, for lack of a better term. Theseindividuals feed off of other people by controlling their actions bymanipulating their thoughts. Thepsychic vampires are what made me want to read this book so badly. I thought itwas an idea that was far too interesting to pass up. They are unique, and theydo live up to the hype I had built for them in my mind in some ways. That beingsaid, they did, often, toe the “this is so absurd it’s ridiculous” line. Thelack of believability at certain parts of the book did affect my enjoyment ofthe work as a whole. If there had been less of those unbelievable-eye-roll-worthyscenes in the book, Carrion Comfortwould have been far more haunting than it actually ended up being. Anotherissue I had with Carrion Comfort as awhole is the length. The book is almost needlessly long, weighing in at nearly900 pages, when I think the whole story could have been told just as well withtwo hundred fewer pages than it contained. This problem is blaringly evidentwith major portions of the plot painfully lagging for pages and pages, andother portions of the plot that are almost redundant in how they are handled.This also means that it took me nearly half the book to get really interestedor engaged in the plot at all. Despitethese two rather large complaints, CarrionComfort is incredibly well written in such a way that it can easily sinkinto the readers psyche and do what horror books are best at doing: give thereader the heebie-jeebies. The characters are incredibly interesting, if notcompletely compelling or believable. In fact, the most interesting andcompelling characters are the ones that have the worst sense of morality.Simmons seems to shine when he is depicting individuals the reader willprobably absolutely loath, while the characters on the other side of the coinseem almost boring in comparison. 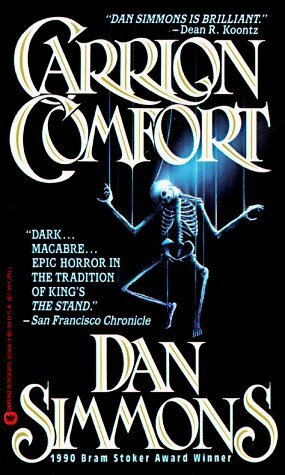 Carrion Comfort is called a horrornovel, but I think it reads more like a psychological thriller than anythingelse. There are plenty of psychological and political themes running throughout the work and anodd chess theme that serves to unify all the different plot points in the book,which wasn’t quite unique, but I’m sure the author thought it was. Carrion Comfort is dirty, gritty,violent and bone chilling at parts. Its needless length and meandering plot thatsometimes dips into being almost completely stagnant, however, balances thisnicely. Carrion Comfort could haveused a strict editor, which would have helped get rid of many aspects of theplot that just weren’t useful to the reader at all. This would have changed Carrion Comfort from being anentertaining read to a tightly wound, nicely paced, perfectly plotted, bonechilling work of horror. Instead, it was a solid 3-star book that took way toomuch effort to slog through and didn’t showcase the author’s talents nearlywell enough. Next PostDiscussion: What are your favorite children’s book?